Work your strengths, Stablize your limitations! One of the ingrained aspects of self development strategies that I have noticed to have thrived over a vast period of time is that there is a lot of emphasis laid on the fact that one needs to recognize their weaknesses and spend an innate amount of time and effort working on them to improve. Although I do agree that a very important aspect of self improvement is the need to recognize your strengths and weaknesses, I do not believe that a telescopic review of your weaknesses and inordinate amounts of time and effort spent focusing on them results in any marked shift to strengths. 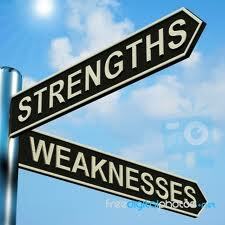 It’s key that you need to truly recognize, understand and come to terms with your strengths as well as limitations. It’s also important to have a plan in place to stabilize your limitations or weaknesses. To be at your productive best and to benefit from what you do, you need to focus on your strengths than your weaknesses. The effort spent on trying to overcome a weakness is better spent on honing your strengths and realizing its potential. You are bound to come out better, stronger and deservedly rewarded if you apply this strategy. Not everyone in this world needs to be good at everything. It’s perfectly alright to embrace your limitations while you exert your strengths. There is no need to feel guilty or feel belittled for things that you do not share an interest in or that do not reflect your best self. But, each one of us has some aspects that we enjoy, are good at and can create a distinguished place for ourselves. Concentrate on exerting yourself in these areas, areas that you enjoy working in and can contribute your best to. Your strengths will distinguish you. Work on further excelling in them and exercising them to your very best. Not only will you enjoy what you did and be at your productive best, but you will also cherish and pride the rewards it will reap for you. This in turn motivates you further, to go beyond your best in what you already excel in. Imagine the infinite potential you have available to unravel with your strengths! Work your strengths to discover your infinite potential while you recognize your limitations and stabilize them enough to not influence your pathway of progress. This entry was posted in Motivation and tagged limitations, potential, progress, realize, self development, self improvement, stablize, strengths, success, weaknesses by Rajeev Mudumba. Bookmark the permalink.